Please join us in praying for the Global Proclamation Commission, a 10-year human capital campaign to connect, unite and strengthen 100,000 pastors from 200 countries by the year 2020. The GProCommission was launched in 2010 and seeks to address the needs of undertrained and isolated pastors, especially in Asia, Africa and Latin America. These pastors, more potent because of their participation in the Global Proclamation Commission, can create healthier churches with the aim of better carrying our the Lord’s Great Commission. The GProCommission is being executed through three types of training events: The annual Dallas Global Proclamation Academy, multiple national Global Proclamation Academies each year and, Lord willing, the 2016 Global Pastoral Trainers Congress in Manila, Philippines. Also, praise God for the way He is using RREACH and our pastoral training model (both training pastors AND connecting them to one another). Actually, to say the least, I’ve not seen a program that is so compressed—short days, but very impactful. For those of us who are young pastors in ministry—we are confronted with a lot issues. Some of those issues have to do with being validated by older ministers. And to a large extent, orientation into ministry has to do with—you teach certain kinds of things; the gospel. But, coming to GPA, first of all, there is this stripping from old ideas that are not really relevant for kingdom work. And then this remodeling after a pattern that is, to a large extent, proven to be very, very effective. Especially expository sermon presentation. To a large extent—to friendships made anew, to teaching that has come our way – very strategic teaching come our way. I am a better preacher to the little audience that God has made in my hands to nurture in the faith. 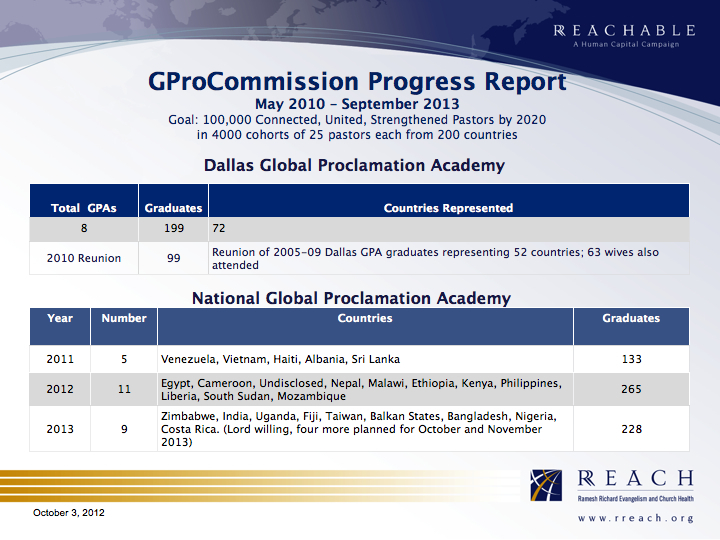 That pastors who attended national GPAs in 2011, 2012 and so far in 2013 would remain connected and united and would be multiplying their training toward the vision of the Global Proclamation Commission. That God would open doors for National GPAs in the 13 additional countries considering hosting one in 2014.